When I was in elementary school I always secretly loved projects where I got to make dioramas. I’ve always loved miniatures and love making little scenes. 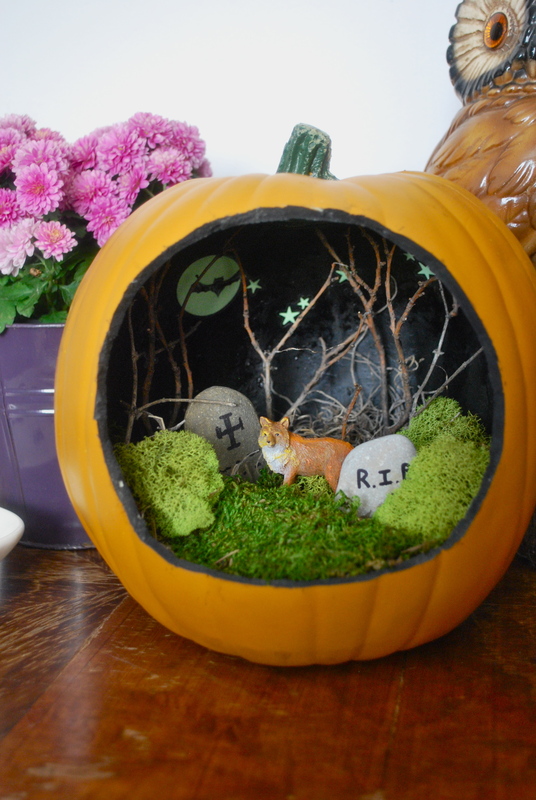 So when I found some pictures on Pinterest here and here that combined my love of dioramas with my love for Halloween I knew what I had to do! I found the foam pumpkin at Goodwill. Someone had tried to carve what sort of looked like a castle and gave up so I buggy it and just cut a big hole out where they had started carving. 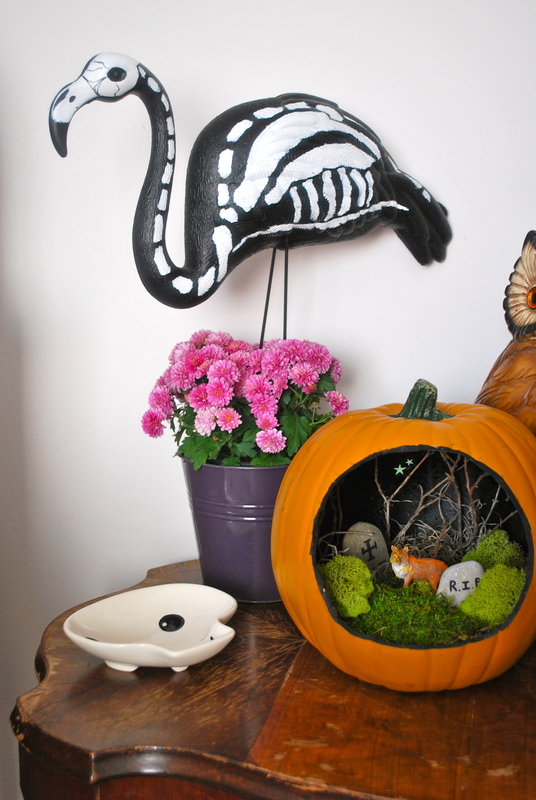 Of course you can just by a new foam pumpkin from any craft store in the fall. Just make sure it’s the hallow carve-able kind! 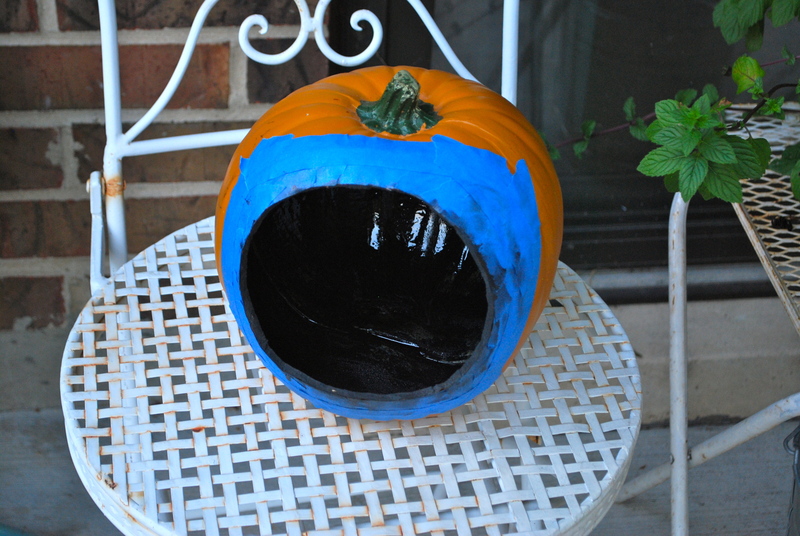 I chose to spray paint the inside black as shown below but it’s totally up to you what you want the inside to look like. I used rocks, sticks and different kinds of moss for the terrarium. The moon and stars are glow-in-the-dark stickers and the fox is a little figurine from Joann’s. Finding things to put in is half the fun! I’m still on the hunt for very tiny battery powered led string lights that I can attach the the top inside to shine light down on my scene. It’ll be fun to switch things around every year. 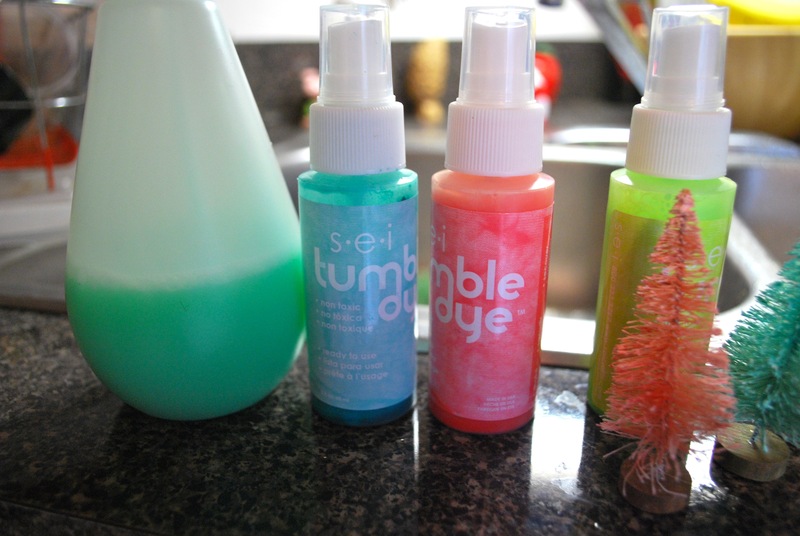 Now get to crafting! 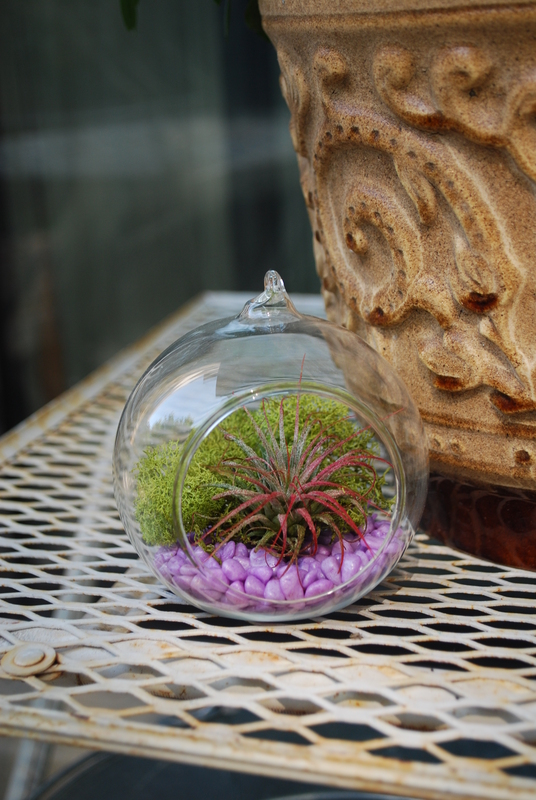 I’ve actually been wanting an air plant for a while after seeing them all over Pinterest. One of my friends bought some at the Renegade Craft Show in Chicago last summer and while one died she said the other one was pretty easy to care for after she got the knack for it. According to articles I’ve read the best way to care for them is to submerge the actual plant in a glass of filtered water for a couple hours and let dry on a paper towel after that. Do this once a week or so. I’ve had mine for a couple weeks now and this seems to work so far. 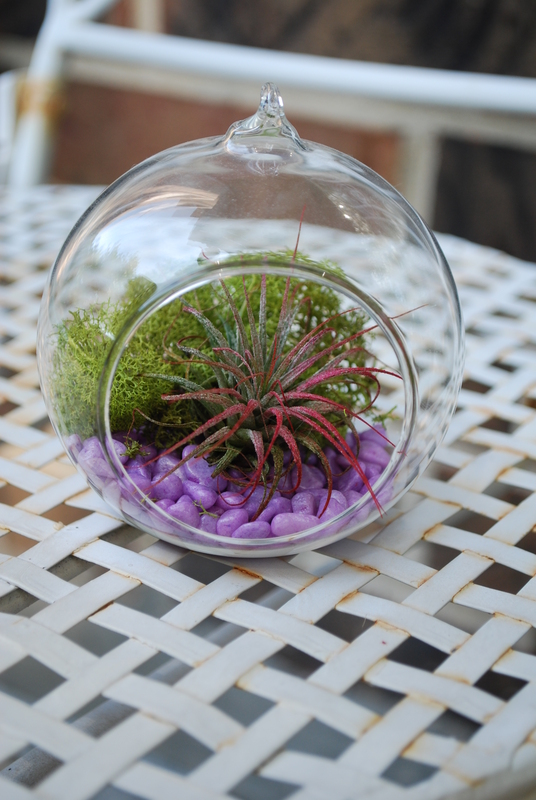 If you are new to air plants they don’t need soil because they don’t have roots. They get their nutrients from the air. (hence the name) They like bright but filtered light best so as long as you keep this in mind they are extremely easy and fun to display. The possibilities. Are endless and here are some fun examples I found on Pinterest from Centrogarden, Buzzfeed, and Decoist. 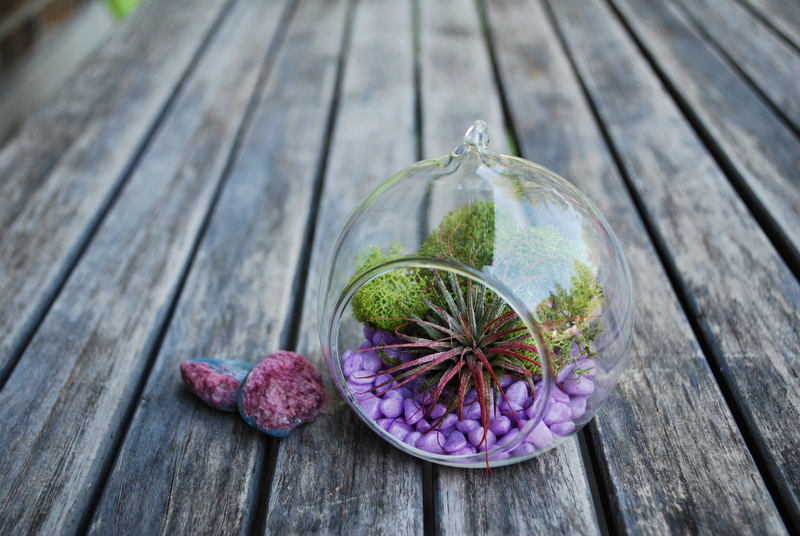 I put mine in a little terrarium with some sphagnum moss and fish rocks. 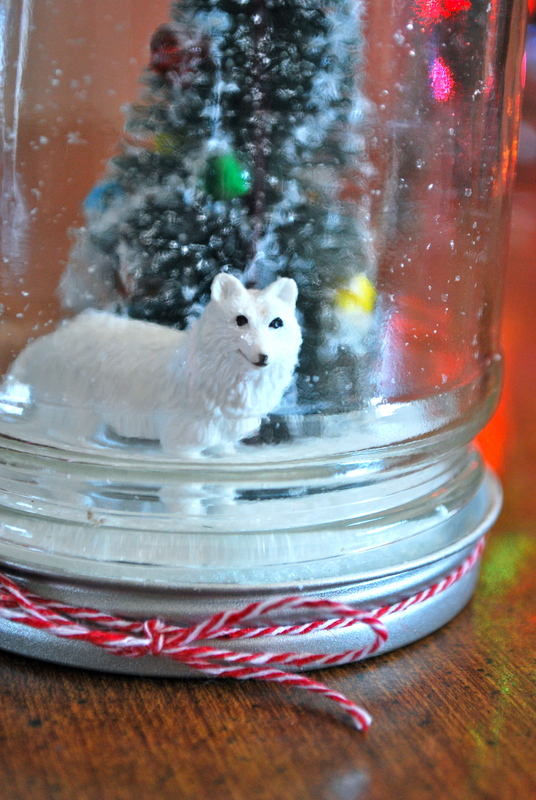 The glass ornament is from Joann’s. I bought it last winter after Christmas on sale. I’m going to hang it with jute and hang it up somewhere. Hey everyone, it’s Wednesday, woohoo! We’re half way to the weekend and even though we just got about 4″ of snow here on Monday, (not cool Mother Nature) I’m excited for Spring and Easter. 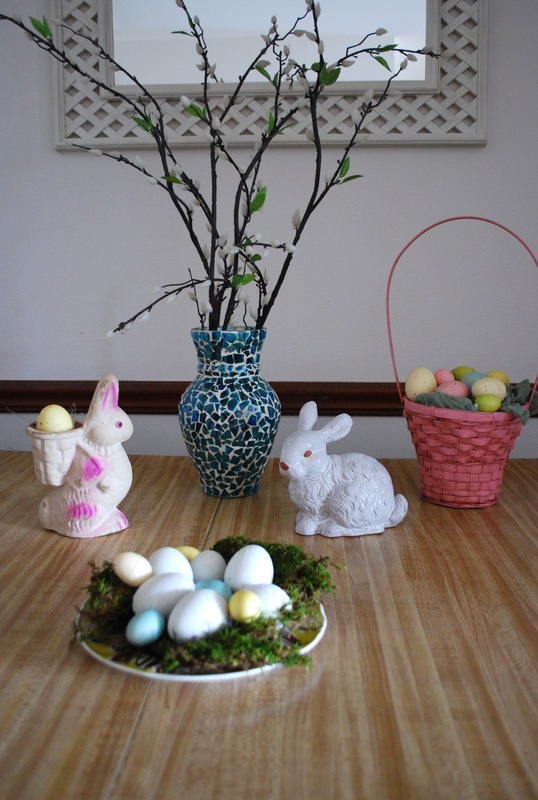 My family never did a whole lot to celebrate Easter other than Easter egg hunts and and getting together to eat too much food, but its always been one of my favorite holidays to decorate for. I think its because I love rabbits and animals in general along with anything Spring/Summer related. 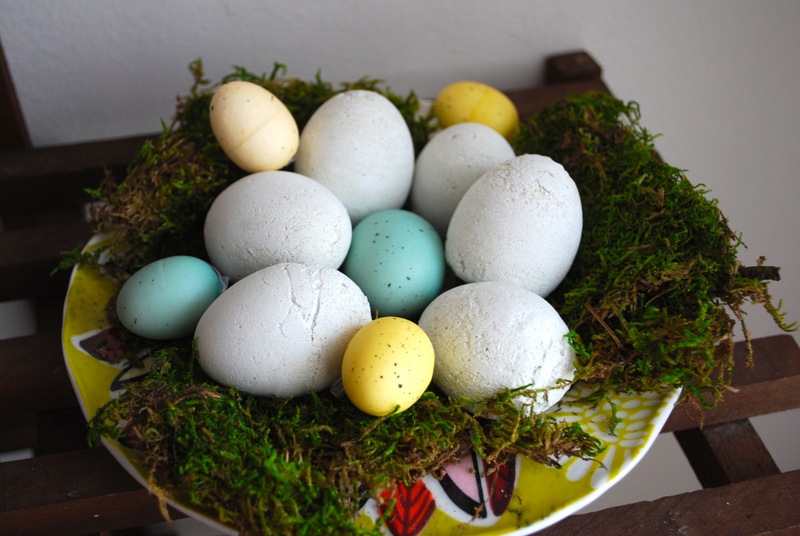 I found this diy on Pinterest by Camille Styles for making concrete eggs with real egg shells. I’ve actually been working on this for a while because I needed to get enough egg shells to fill. When I would use an egg to cook with I would just break out the bottom with a knife of my finger. You want to take the bottom out so that you can fill it from there and then when the concrete is dry they can stand up. 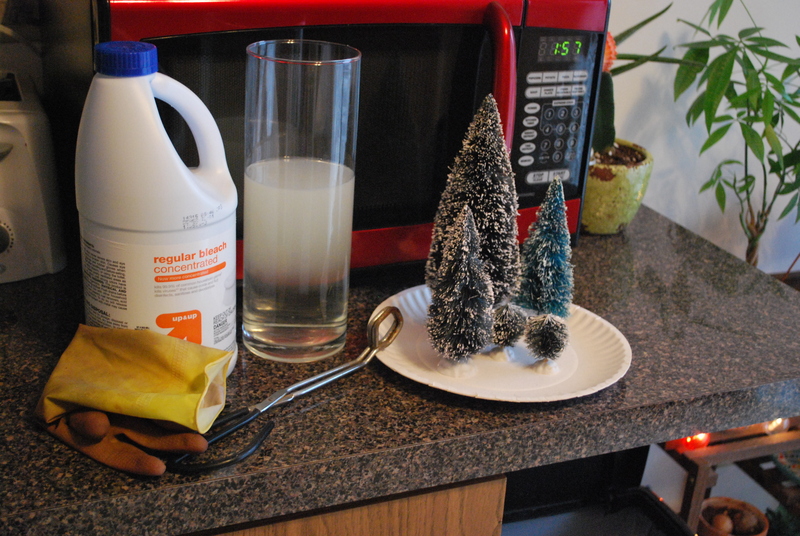 Below are the supplies I used; the cup and knife were for the concrete mix and make sure to have paper towels handy. You can usually find concrete mix at any craft or hardware store, it’s pretty fun to work with! If you’ve never mixed concrete, plaster, or anything similar, I use the mound method which is where you fill the cup up with about 1/3 water and slowly add the mix until there is a little mountain on top that doesn’t sink down immediately into the water. 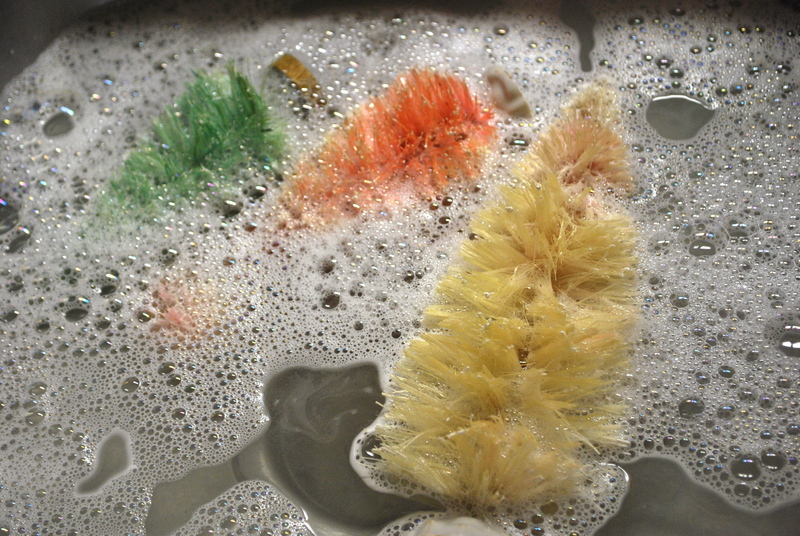 Stir it up until there are no clumps or bubbles. it should be about the consistency of pancake mix. I have to admit I got some of mine a little too thick and some didn’t quite turn out perfect but I like some imperfections in mine. 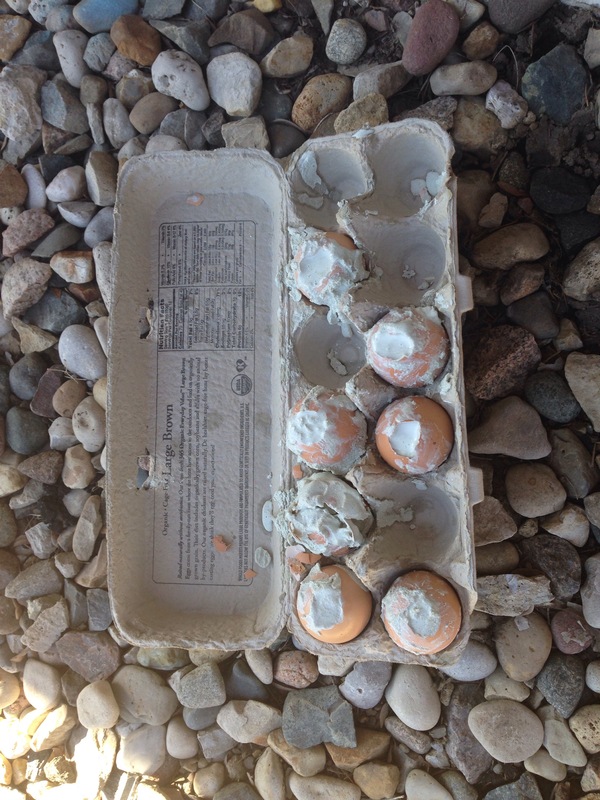 After your eggs are filled let them dry outside for at least 24 hours. Use an exact-o knife to help peel the shell of and that’s all! 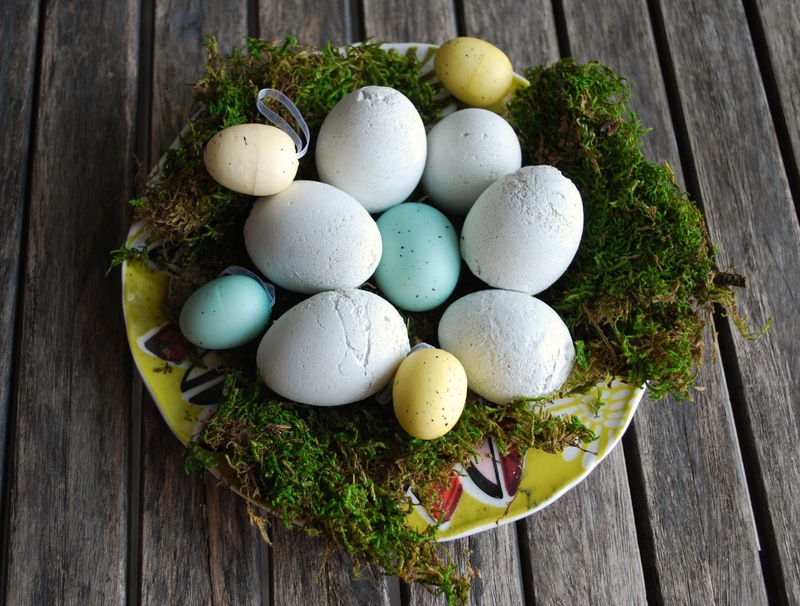 If you’d like you can paint or stamp you eggs or anything else you can think of. I might do something with mine but I’m not sure what yet. If I do change them I’ll give an update. P.S. the adorable basket and grass cloth are from my good friends at Glory Days Mercantile, check them out they have tons of cute Easter decor! Hola peeps! I took a bit of a hiatus from blogging, not really on purpose but more because I was too busy to start/work on new projects and before I knew it January was half over! I am totally scared by the way time works and wish things would slow down just a bit. Now its that time of year that I just want to bypass to warmer days but I’m trying to enjoy the here and now and find the good, even in this frozen wasteland, because one day I’ll look back and miss these times! 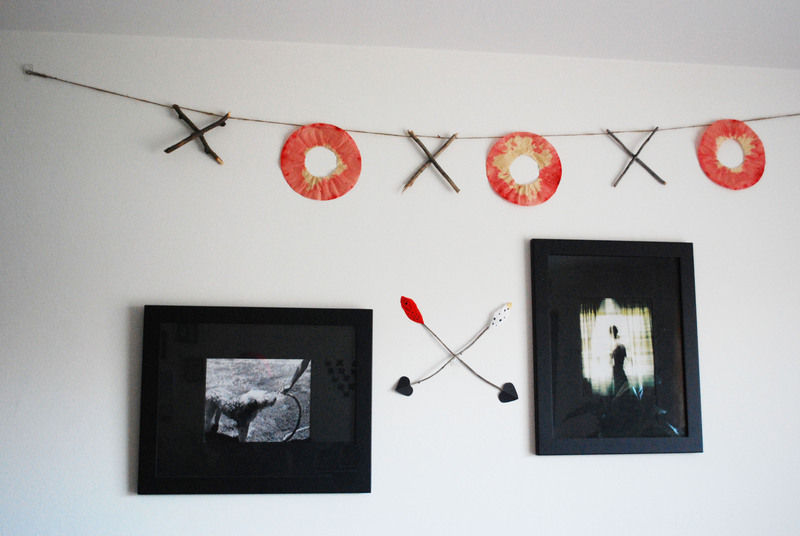 I’ve never really decorated too much for Valentines day but since I have a craft blog now I figured I’d see what I could come up with, and love the results. I’m really starting to get in that heart everything spirit now and even though I don’t do frilly decorations (unless they’re vintage of course!) I made some simple nature inspired pieces. 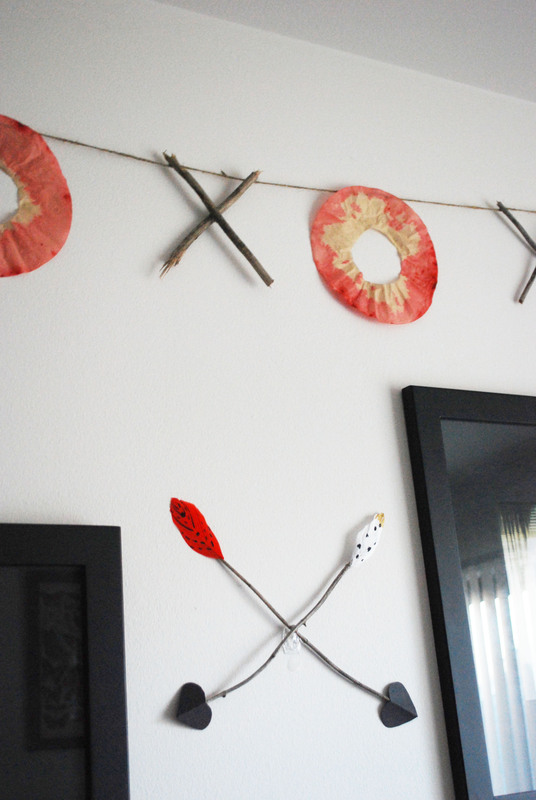 The arrows are inspired by similar ones I found on Pinterest. 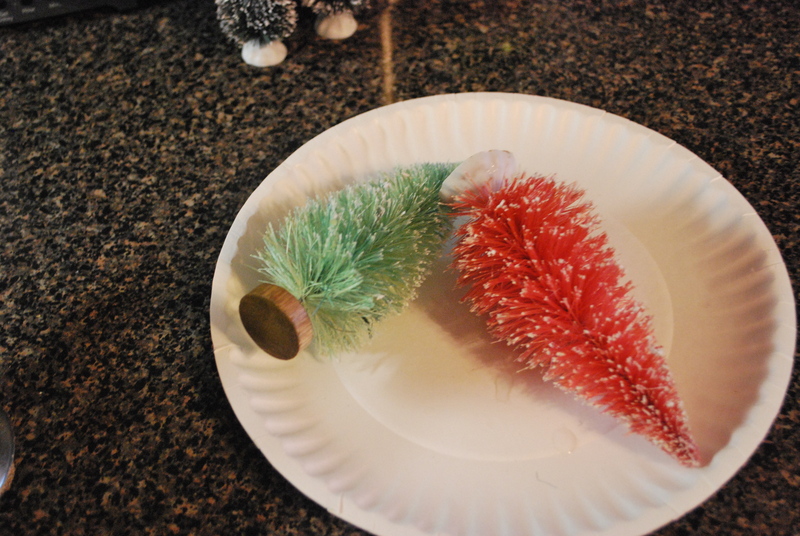 I used sticks for mine though and used paint and marker for the feathers. the heart tips are cardstock. I also made some of the feathers into earrings for my Etsy shop Peppermint Emporium. 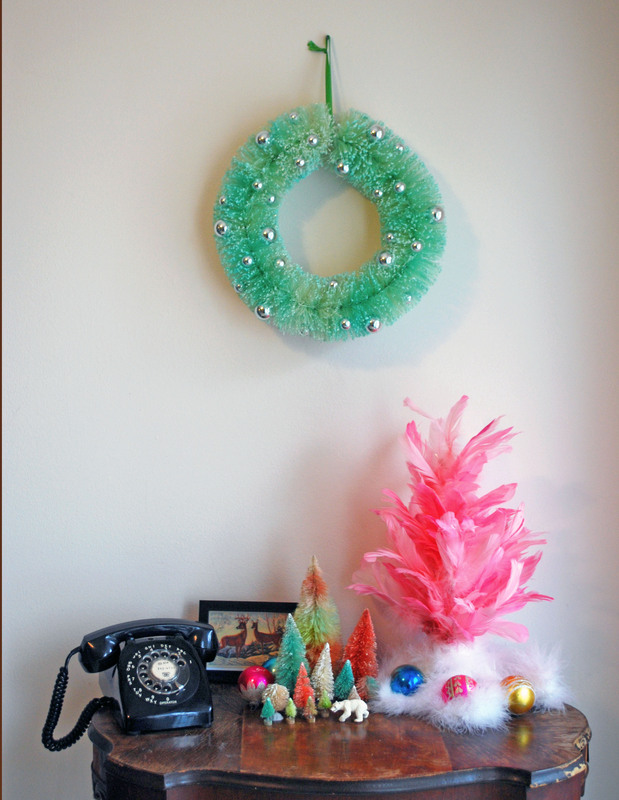 The garland is straight from my noggin and is just sticks, coffee filters dyed with watered down craft paint and twine. 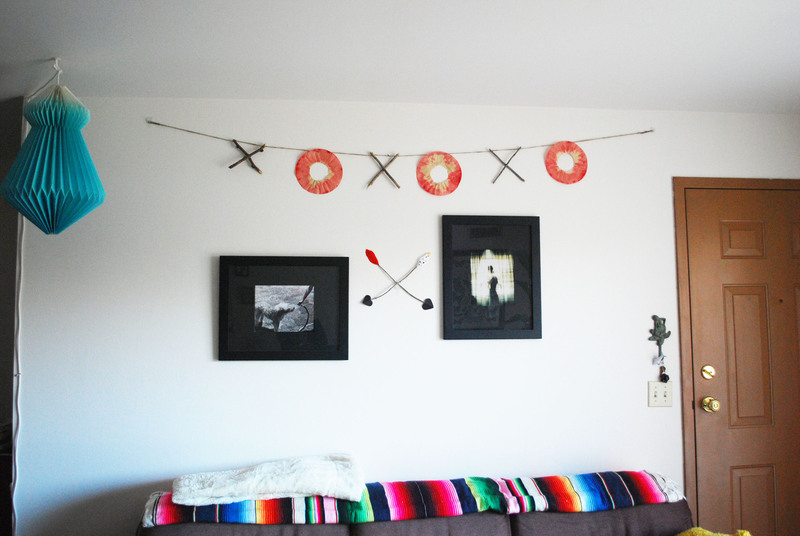 grab your glue gun and there ya go! Ben buys the unbleached coffee filters so I was a little disappointed that they weren’t white, but afterward I decided I liked the brown color better, it lends itself to the natural rustic vibe I was going for. 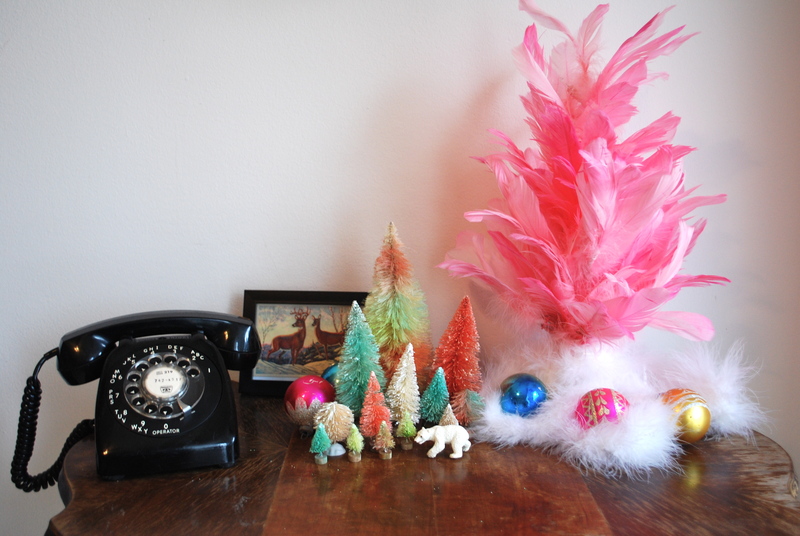 Hello, I’ve been busy trying to get all of my Christmas shopping done and make the presents that I am hand-making. 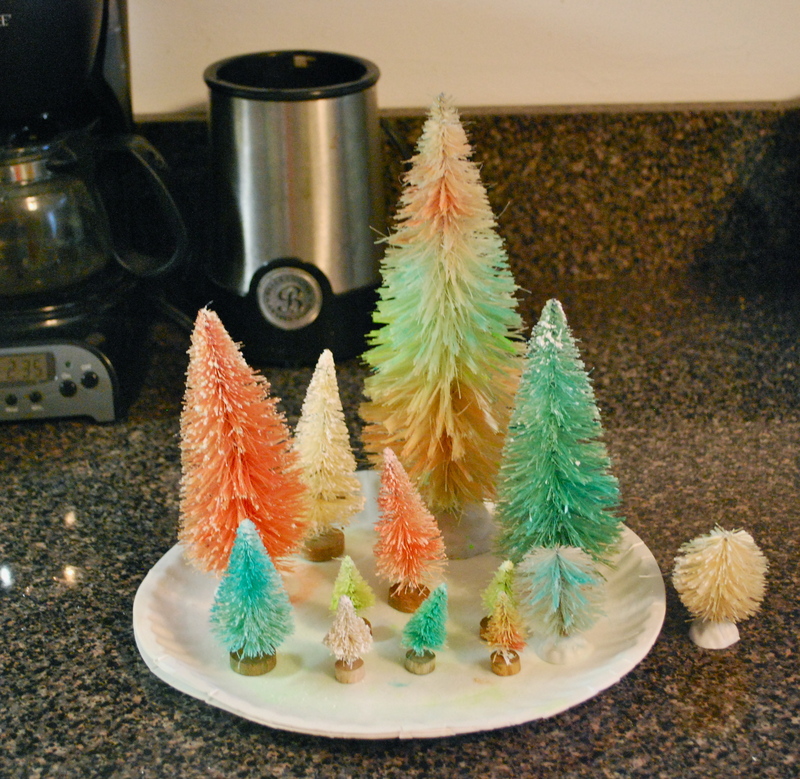 This was actually something I made last Christmas as presents for everyone and silly me I didn’t take any pictures of all of them before I gifted them, probably because I didn’t have a blog yet, but I do have one left. I kept this little guy for myself to put out. 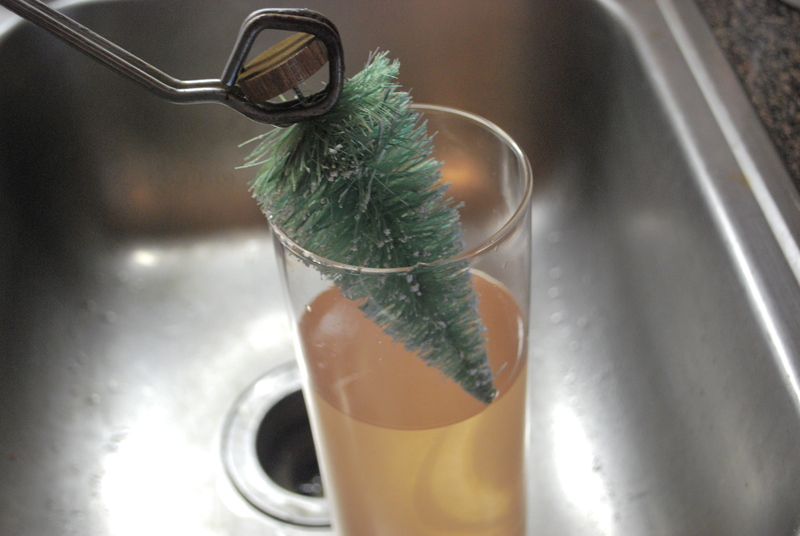 I had looked at quite a few different blogs to see how they made theirs and after reading about how the ones containing water and glycerin had made the green of the bottle brush trees bleed after a year, I decided to go without liquid. 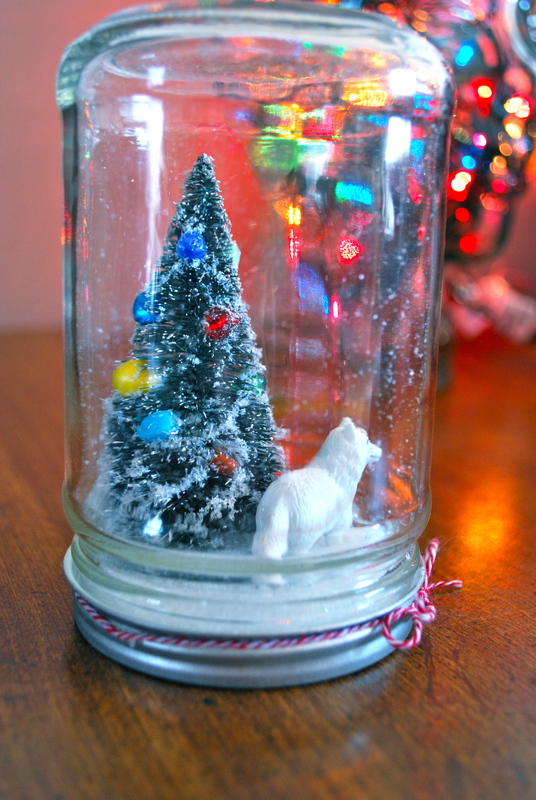 I was worried it wouldn’t look as cool but I was pretty happy with how they turned out, as I was going for more of a terrarium scene than actual snow globe I guess. Plus I didn’t have to buy glycerine! Tiny winter animals, cars, people, houses, ect. 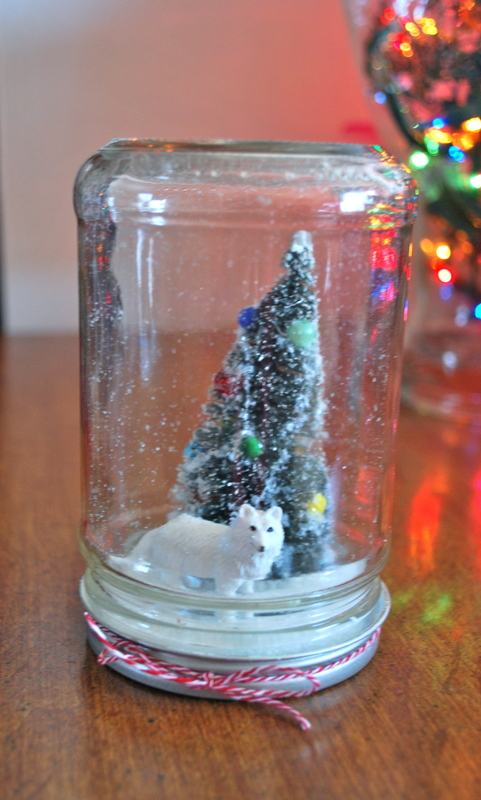 I glued the tree and animal to the inside of the lid and put the desired amount of snow in the jar. I then screwed the lid on after everything was dry and voila, It’s that easy! I’d love to see what yours look like so put them on Instagram and hashtag them #peppermintsandhoneybees.